550 pp. At the time of this review the book holds a 4.8-star review on Amazon with 1837 Reviews. Extras include Marissa Meyer interviewing Mary Weber and a teaser chapter of Fairest, the “add-on” book expanding the Lunar Chronicles to include the story of Queen Levana as a child. “Cress, having risked everything to warn Cinder of Queen Levana’s evil plan, has a slight problem. She’s been imprisoned on a satellite since childhood and has only ever had her netscreens as company. All that screen time has made Cress an excellent hacker. Unfortunately, she’s just received orders from Levana to track down Cinder and her handsome accomplice. Marissa Meyer continues her Lunar Chronicles with book three of a four-part series. 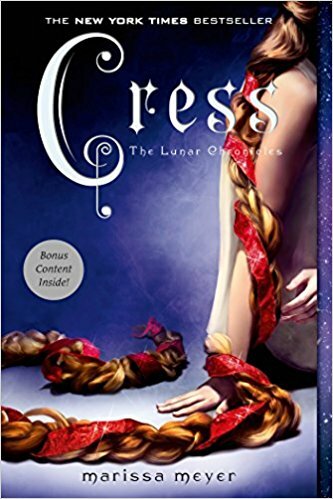 Just as with book 2, I say that Cress should be read after Scarlet. A reader who has fully embedded in this series mashing science-fiction and fairytale will already be invested in the characters, know them, and be less confused as the cast blossom delightfully. Meyer ties together threads across the novels, revealing the deeper parts each character plays in this story of Queen Levana’s attempt to dominate Earth the way she has done on Luna. An existing series reader will also be able to bounce across the eight or so point of views. Retelling Rapunzel, Meyer makes the same creative leaps of books one and two, never disappointing me at how the characters arrive at those how-will-they-get-out-of-this-mess catastrophes, and more importantly, how they’ll get themselves out of them. In Scarlet, we learned more about the rakish Captain Thorne who had been a secondary character introduced at the tail-end of Cinder. Now in Cress, as a mostly invested team member, we’ll learn more about him through Cress’s research. Because she’d been tasked to find Cinder, Cress had found images of Thorne. Captive in her satellite, Cress has turned him in a poster-boy hero, whose actions, she’s sure, have been misunderstood by everyone except for her. “Cress had continued to dig, entranced by his path of self-destruction. Like watching an asteroid collision, she couldn’t look away. “But then, strange anomalies had begun to creep up in her research. Cress’s image of him makes the meeting of these two characters delightful, as his history of past and current law-breaking escapades collides with her certainty that a handsome man equals a heroic man. Because of how she sees him, she makes me yearn for him to be that better man. This story, like the previous book, is as much Cinder’s as it is Cress’s. And, like the previous books, we see from Cress’s prince’s eyes the same as we have of the love interests for Cinder and Scarlet. This deepens the tension, especially when that character reveals knowledge the other key characters don’t know. Knowing Levana’s actions magnifies the need to resolve the question for me—will all of these characters reach a happily every after? Being a retelling, Meyer does not have to do that for the storylines. Meyer also introduces us to the Earth’s Middle East, moving the action through twists and turns of motivations, counter motivations, pretend motivations, and, of course, the fairytale’s story line. Meyer’s art as a storyteller grows; but this time, in a few places, the pace did lag. Or maybe it was because I had too many obligations tearing me from the book, and I found this one easier to put down than Scarlet. Because I’ve fallen so far behind in my reviews, I can’t give my usual depth of review. I can say that Meyer’s world deepens with each novel as she embeds fresh details that help us understand the history between the worlds, on the worlds. Stay tuned for my review of the final book in the series (not counting the add-ons of a short story collection and Lavana’s own novel, neither of which I’ve read yet), Winter, in another few days.